Hello! Another friday- another link up with Erika and April. We had our kitchen and foyer/stairway painted this week and went with BM storm. I was nervous it would be too dark but I really love it! I used to be scared of dark colors but I'm really learning to love them. We started with Grey Owl in our old house which is very light, then we went to Coventry Grey in our living room which I love too, but Storm was really a risk for me and I'm so glad I went with it! I also chose a color I never would have imagined for Carter's room- I'll share pics one day soon! A few months ago I was the lucky winner of a Hooray Everyday store credit. I couldn't wait to pick something out. 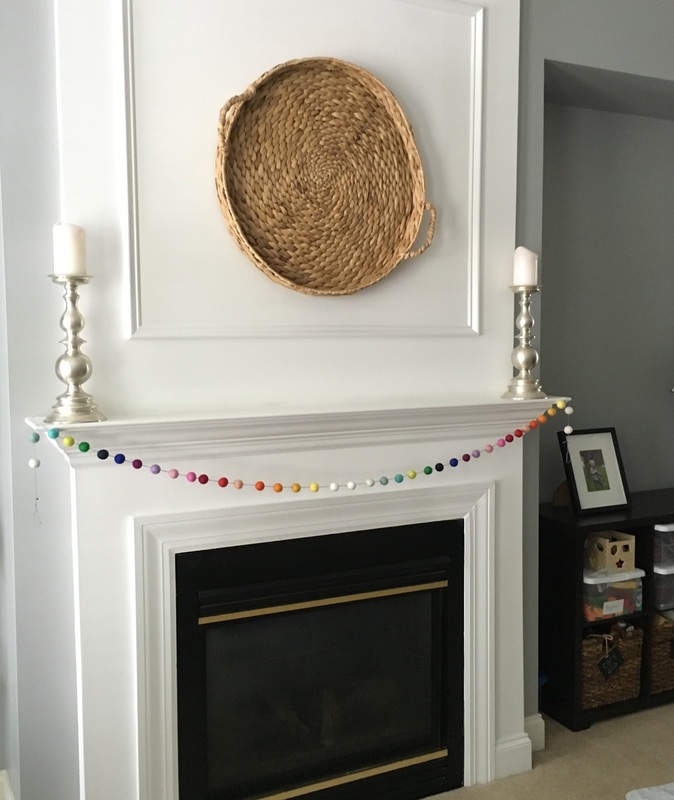 I went with this multi color woolie garland. My decorating style is pretty neutral so I love how this gives our living room just a little pop of color and it's perfect for summer! You can see Coventry Grey in the corner over there! A few weeks ago I was on the search for comfy flip flops and Jenn suggested Cobians. I had never heard of them but off to Zappos and Amazon I went. They had a zillion great reviews! The only problem is there are so many different styles. I went with these and so far I'm super happy with them! I'm still struggling with the bathing suit debacle! I've ordered and sent back a few already. So right now I have 2 black one pieces from Target (one from last year and this one from this year.) Neither are great (or supportive enough) but the black conceals well! Today this one popped up on my side bar and I think it's adorable---but I'm just not sure the lack of chest support would do me any favors! Please share with me supportive, cute bathing suits, ladies!!! I was so excited when I saw Ted Baker had DD/E chest-sized options so I ordered a one piece and two piece and they still didn't fit. And now just a little life update. Round 2 of the babysitter went well again this week. Reid screamed and clung to me at first but after they left for a little walk he was fine! Again I only had an hour and a half to run some errands but I enjoyed my alone time and when I got home they were smiling and happy! Next week we'll go for a whole 3 hours! Carter finished swim lessons and is begging for more. It's nice that they are 4 days in a row every morning but it takes up our whole morning- so it's debatable whether we'll do another 2 week session. And a little story to end for all you moms who can commiserate. Yesterday I had a headache and Reid was extra (is that even possible!) clingy and fussy so he went down for a nap early. When I came down to take Carter up for quiet time he was hungry (of course, even though he just finished lunch) so I said he could have a few pretzels. So he got the bag out and I turned my back and he poured the entire (half) bag and salt on the floor (by accident.) So there's that. Just what an irritable mom who's ready for naptime silence needed, right?! LOVE that color of your foyer! What color did you go with for Carter's room? I purchased a new suit from Target this year, but I'm on the hunt for one more. I used to have a drawer full of swimsuits, but then I had kids, so now I have one. haha! I love the color you chose for the foyer! It looks great! That garlend is AWESOME!! I want some too. I think bathing suits are so tough after kids. Ugh! I found one that's really cute on amazon, but I've heard it a knock off and that it fades quickly. Boo! 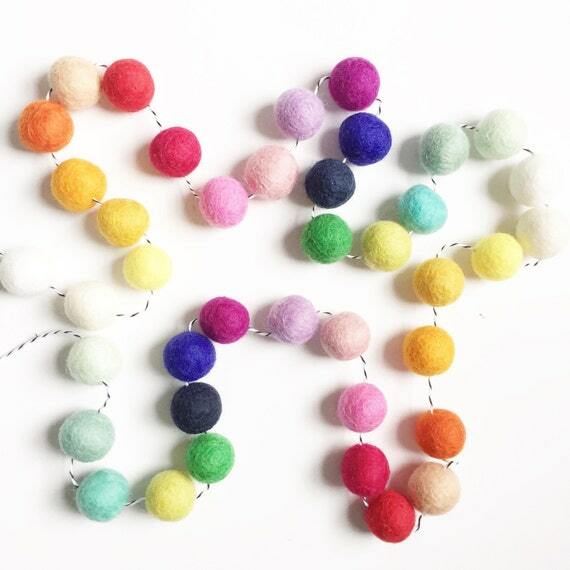 I love that garland! And that swimsuit! I LOVE BM storm! We used that in a few rooms in our last home and I loved it. Such an awesome gray color. Great choice! I love BM Storm! We have now used it in both our houses, and it's still my favorite! Hi, I just got your card to go along with the favorite things swap and came to check out your blog. I notice you have big chest swim suit issues. I have that issue too and I just bought a tankini top from Land's End. I chose a DD and it seems to fit! I love that color! We have a similar shade in our open kitchen/dining room/living room area. I was nervous about the darker color as well, but it works!